Every day at midnight server time, or 16:00 local time, carbon performs log rotation and my graphs play "catch-up" for 1-3 minutes. Most of my metrics are impacted by this: the line will dip down before shooting back up, right at the time when the server is rotating logs. 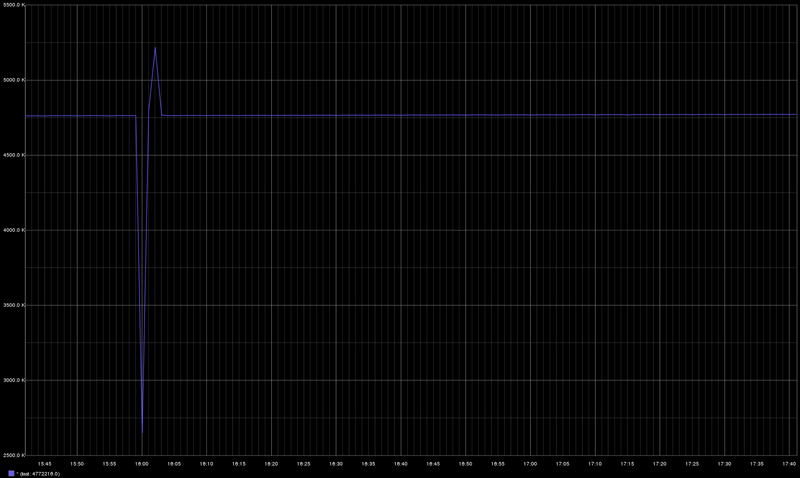 I currently have between 60k and 70k metrics per minute sent to my graphite server. This behavior didn't start happening until 20k metrics per minute or so. I have attached a screenshot of this behavior. The logs that are getting rotated live on SAS drives. The whisper databases live on a separate, high-performance storage device. There is nothing in the logs that indicate a problem. Log rotation should not impact the running application whose logs are being rotated. If I could turn off rotation, I would just send the logs to /dev/null. Seems like a lot of overhead that could be avoided if there was a simple switch for all logging. The packager chose to use logrotate to rotate the logs and perform a restart of carbon to force recreation of the log files. Unfortunately, a restart of carbon is problematic as it causes it to close connections and stop listening while it flushes all cached metrics to disk. This flushing can take many minutes depending on how large the cache is and what MAX_UPDATES_PER_SECOND is set to. Apologies for not getting back to you sooner. I discovered that some of my agents were sending junk data at midnight GMT. Once I solved that problem, my graphs recovered. Oddly, the graphs that were impacted were not necessarily the same graphs that had known bad data coming in at 4:00pm. I've added strict checks to all agents responsible for sending metrics, and this problem has not recurred. Logging is still an issue for me, so these patches are helpful. Thank you!